Fig. 1 – Hydraulic multiplier in line with the pneumatic actuator, model: HLU. Kratospack is a company recently established, set up with the precise aim of developing and offering state-of-the-art high tech products to the market. Thanks to a long-term experience gained as key partner of a renowned Company, sector leader in Italy until some years ago, Kratospack has decided to transfer extensively such experience in a range of new innovative products. This range of products includes the well-known so-called power units that the Lombard Company can offer in order to satisfy the several requirements in the industrial automation market. The power unit is the synthesis of two applied technologies: the pneumatic motion, fast and cheap, used for the approach and the return from the working area and the hydraulic power increase, obtained by a mixed multiplication system of compressed air – hydraulic oil, whilst the strict and indispensable separation of the two fluids is guaranteed. The growth of the hydraulic force is directly proportional to the pneumatic pressure involved. The power units, initially proposed in the bores Ø mm. 50, 63, 80, 100, 125, can be used either mounted on a production line or on a crank/column structure (press) or on all those applications where a fast approach to the working area is required, with relatively a short working stroke, for example to fix bearings, bronze sheep brasses, bushes or, more in general, in cold material forming operations, like drawing, bending, caulking, clinching, shearing, marking and riveting. In the prospects of the management of Kratospack s.r.l. there is also the range extension, offering the bores Ø mm. 160 and 200 to the market, during the second half of 2019. The evident advantage that we can notice using these units in comparison with other cylinder types exploited for such operations is the high speed of approach to the working area, obtained with normal line pressures (around 6 bars); this means a noteworthy energy and economic saving if compared to the equipment needed to move heavy quantities of oil under pressure, a smooth, precise and easily controlled working stroke, thanks to the characteristics of the hydraulic oil; a very fast return stroke to the rest position , it too pneumatically controlled. The speeds of approach and return from the working area allow very fast cycles with a consequent increase of the productivity. 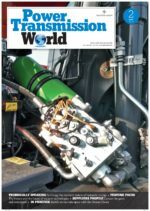 Another undisputed advantage of these power units is the maximum cleanliness of the working area in comparison with standard hydraulic presses (or cylinders); this allows their use in fields like automotive, white goods (household appliances), avionics, assembling of complete lines and so on. Fig. 2 – Hydraulic multiplier in parallel with the pneumatic actuator, model: HPU. Fig. 3 – Operating diagram. A. Power unit at rest. B. Inlet to port 1, motion of the front piston rod till the contact of the piece (approach stroke). 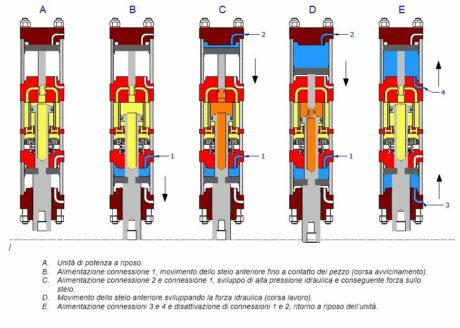 C. Inlet to ports 1 and 2, growth of high hydraulic pressure and consequent force on the piston rod. D. Motion of the front piston rod developing the hydraulic force (working stroke). E. Inlet to ports 3 and 4 and disconnection of ports 1 and 2, return of the power unit at rest. Initially the power units will be offered without the mounting structure and they will be in many cases interchangeable with the most common models offered on the market. For all above- mentioned bores, two versions are already available: the HLU version, in which the hydraulic multiplier is positioned in line with the pneumatic actuator, and the HPU version in which the hydraulic multiplier is positioned in parallel with the pneumatic actuator. Considering the same total stroke (that means the sum of the approach stroke and the work stroke), the main difference between the two versions resides in the length dimensions, shorter in the case of the HPU version, to the detriment of the side dimension. The HLU and HPU unis are designed and guaranteed for uses with operating pressures up to 10 bars. Besides the two just mentioned series, also the line called “X”, available for both configurations, has been developed and released on the market. The distinguishing element of this line is the possibility of obtaining, against a little increase of the length dimension, higher forces than in the standard version (around +25% and +30%, according the bore), considering the same total stroke and the pneumatic pressure used (in this case the maximum operating pressure is up to 8 bars). The codes to order this version become HLX and HPX. The power units are equipped with pneumatic piston including the magnetic ring; such characteristic allows, also in a second step in case the needs of the Customer should change after the purchase, the use of electronic position and force transducers, in order to have a complete process control, through the data supplied to the controller, useful for both the local data storage and for the interfacing via Ethernet (as option also via ProfiBus/ProfiNet). The quality of Kratospack products is guaranteed by the constant attention to the quality of components and of machining operations, completely in accordance with the policy of vertical structure, which provide the range with great reliability and high performances that last in the time. Finally, the assembled product is 100 % electronically tested, with recording and specific filing of data.